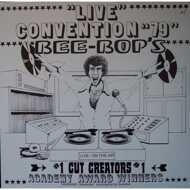 Available for the first time ever, Disco Wax presents "Live Convention '79." Destined to immediately become a collector's item, "Live Convention '79" serves as a companion and predecessor to the previously released "Live Convention '81" and "Live Convention '82", each which have fetched hundreds of dollars switching hands from collector to collector. "Live Convention '79" features digitally re-mastered audio from a vintage old school throwdown, recorded straight from the Jamaica Queens Armory sound board in 1979, on a night where an all star round up of legendary artists graced the stage. Artists include: Grandmaster Flash, Mele Mel, Kurtis Blow, DJ Hollywood, Eddie Cheeba, Lovebug Starsky, and DJ Divine. The recording serves as a glimpse into an atmosphere that previously could have only been enjoyed by a select few, who were in the right time and place to witness the birth of what has become a global phenomenon: Hip Hop music. Highlights included: Grandmaster Flash's precise quick mix theory being demonstrated, Mele Mel and Kurtis Blow rocking back and forth, hearing the artists take verbal shots at Sugar Hill Records, and hearing the gifted crowd interaction skills of DJ Hollywood, Eddie Cheeba, and Lovebug Starsky.